The feline featured in the artwork is not your average neighbourhood moggy but a majestic lion affectionately known as Archie - and one of the 'highly-threatened' big cats. Designed by street artist, Dean Zeus Colman, the 260 sq. ft poster, which appeared On Tuesday January 29, 2019, aims to raise awareness of the world’s vanishing big cat population. According to National Geographic, which commissioned the artwork as part of its Big Cats Initiative, lions have now disappeared from 90 per cent of their historic range. 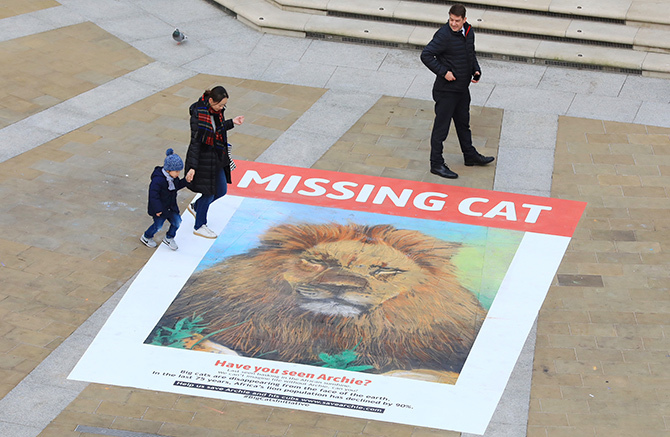 The poster, located in London’s Paternoster Square, was slowly and unwittingly rubbed out by the public as they went about their business - a reminder of falling lion numbers. Zeus completed the artwork using six base colours, 100 chalks, eight cans of spray chalk and more than two litres of paint - and it took him more than 12 hours to complete. He said: “Using the familiarity of a neighbourhood missing cat poster, but with a wild twist, helped bring resonance to the piece. “The magic happened when we unveiled the artwork and allowed members of the public to walk straight across our poster. The Big Cats Initiative is working to halt the global decline of big cats such as tigers, lions, jaguars, leopards and snow leopards in the wild. Dr Amy Dickman is a National Geographic Big Cats Initiative grantee and Senior Research Fellow in Field Conservation at University of Oxford - which runs the Ruaha Carnivore Project in Tanzania. She said: “Lions play a central role in British culture – they are the UK’s national animal and appear on everything from our national football team’s shirts to the door knocker of 10 Downing Street.